Key Difference: The primary difference between a smiley and an emoticon is that the smiley is the cute yellow face, whereas an emoticon is the one created from text. In today’s word, people tend to use words less instead preferring to converse through a crude picture based written language, which users may call smileys or emoticons. While words may be precise, the ease of using a single smiley or emoticon to get your point across has helped these smileys or emoticons to gain popularity. Also, their cuteness or absurdness has also helped their cause. However, people who are not accustomed to the terminology will have some difficulty differentiating between Smiley and Emoticon. In fact, even people who have grown used to using them both might be unclear between the differences between the two. So what do the two words define? A smiley is stylized representation of a smiling humanoid face. Nearly everyone will have come across a smiley even if they don’t realize it. It is a yellow face depicting an emotion, typically a smile. The face is usually round, and usually intended to be cute. Since it development, the smiley have gained a reputation as an important part of popular culture. There are many variations on the typical standard smiley face as each person trying to put their own take on it. However, before technology grew as advanced, there was no way to send cute yellow faces over messages. Hence, people developed a way to use alpha-numeric characters to create a make-shift smiley which serves the same purpose. For example: :) which shows happy. Hence, it can be said that the primary difference between a smiley and an emoticon is that the smiley is the cute yellow face, whereas an emoticon is the one created from text. However, it should be noted that in common parlance the two terms are often used interchangeable without any difference whatsoever. It does not matter that technically they are not the same thing. 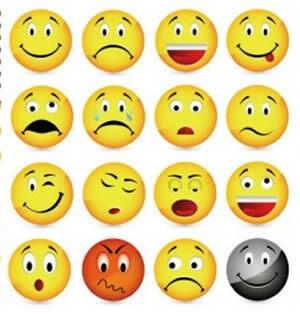 A pictorial representation of a facial expression using punctuation marks, numbers and letters, usually written to express a person's feelings or mood. Viewed after rotation through 90 degrees.